I first told my father I wanted to move to London when I was five. I last swore I would never live in Chicago when I was 25. Yet somehow, despite my best efforts, I’ve not properly lived in London, but have managed the Windy City for over two years. I’ve fallen in love with Chicago, its lakeshore, its giant rats that look like Master Splinter but attack like a friggin’ honey badger, and the friendly and forward-thinking Midwesterners who live here. That doesn’t mean I don’t miss my beloved London, with its winding streets which, on the night bus, make you feel like you’re in A Newport State of Mind. Yes, Chicago may be my husband, but London is my lover. As soon as I get enough money and the cats are grown, I’ll leave Chi-town for Londontown. And like just like when sleeping with two people, it’s hard not to compare everything from size to warmth to overall performance. When I first moved here, it was very hard not to compare Chicago to London. They have many similarities-both are an amalgamation of neighbourhoods which were once separate villages, each with its own unique identity. They both smell brackish and industrial if you catch the wind at the right angle. And both will have hosted the Olympics by the end of this decade. Oh wait. But which is better? Which is truly superior? I set out-and by out, I mean down, on the couch, with a beer-to investigate. In this week’s “London vs Chicago” matchup, we take on three key components of entertainment-sport, music, and telly. Will London leap to the top, or will the Windy City win this one? Find out below in an in-depth study just chock full of alliteration! 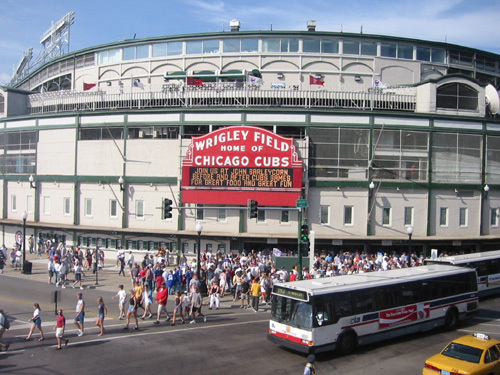 Wrigley Field opened in 1916 and has served as home of the “lovable losers” of Major League Baseball, the Chicago Cubs, ever since. Affectionately known to fans and enthusiasts as “the friendly confines,” it is one of the last bastions of pure Americana. pomp and circumstance. And while there’s no denying that Londoners can make a football match into a Mardi Gras party at Animal House, it can quickly it can quickly turn into the stampede that killed Mufassa. Chicagoans, on the other hand, just get drunk-whether tailgating before the Bears game, betting on NCAA basketball, or cheering on the Blackhawks for a 2010s Stanley Cup three-peat. Sport isn’t just a form of entertainment here, it’s a way of life. I’ve literally seen grown men come to fisticuffs over who the greatest Cub was. Our greatest steakhouse was founded by a sportscaster. A goat is responsible for the Cubs’ century-long misfortune. And we have an entire neighbourhood built around a baseball diamond that is essentially one giant fraternity party 24/7. 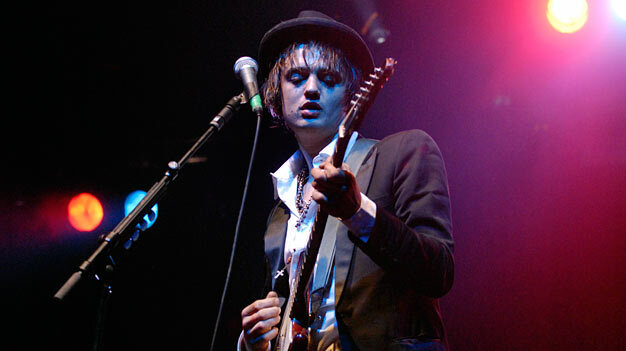 Pete Doherty is one of the most poetic songwriters of this century. And he paints with his own blood, too. entertainment industry, London combines the best of New York, LA, Stockholm, and Nashville, producing an eclectic and talented group of artists. And don’t get me started on the live music scene, from The Hope and Anchor to The Old Queens Head (both in Islington) to the more legendary Royal Albert Hall and O2 Arena. Sure, Chicago has the Metro, the Congress, and a decent local music scene. And yeah, we’re rivaled only by New Orleans in jazz and Memphis in blues. But it’s just not even a contest. Chicago is an X Factor reject; London is Leona. EastEnders was one of my first introductions to workaday Britain. 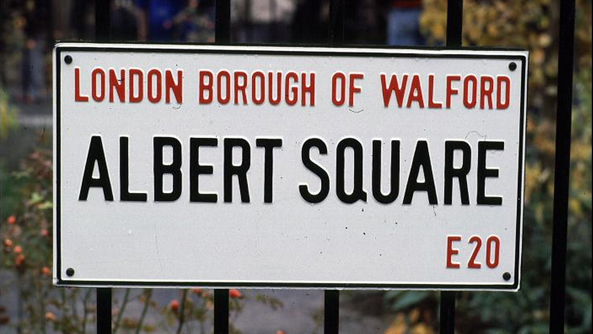 I used to dream of living in Walford. I also wanted to be a rubbish collector. Kids are silly. So London won tonight. But don’t worry Chicago, I still love you and your horrible drivers, your pseudo-Canadian accent and your hot dogs. Actually, not your hot dogs. I like ketchup on mine. Guess in that regard, London wins again. This entry was posted in Chicago vs London, LOL, Musings and tagged albert square, babyshambles, bbc, bears, blackhawks, blue peter, blues, bulls, chelsea fc, chicago, chicago bears, chicago blackhawks, chicago bulls, chicago cubs, cubs, eastenders, islington, london, madhouse on madison, pete doherty, soldier field, the cell, us cellular field, walford, wrigley field on November 1, 2013 by skylarjordan.